Warped Tour 2010 is the 16th installment of the annual Summer Warped Tour festival. Vans Shoes was again the tour's primary sponsor. The first bands were announced on December 18. The 43-date tour kicks off on June 25, 2010 in Carson, California and ends August 15, 2010 in Hillsboro, Oregon. On February 12, 2010 details for the annual "Warped Tour Kick Off Party" were announced. The show took place on April 9, 2010 at The Key Club in West Hollywood, California and featured Warped Tour 2010 bands Andrew WK, Pierce the Veil, The Pretty Reckless, The Reverend Peyton's Big Damn Band, Death Punch, and the "Grind Time Now Emcee Battle" hosted by the Rollin Rockers on the bill. All bands confirmed for the entire tour unless otherwise noted. Dates and stage placements subject to change. The following bands performed on the Alternative Press/Advent Clothing stage on various stops on the tour. 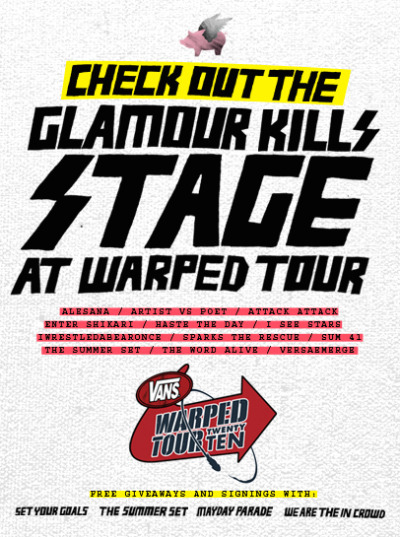 The following bands will be appearing on the Glamour Kills Stage on various dates throughout the summer. The following bands performed on the Ernie Ball stage on various stops of the tour. The following bands performed on the Kevin Says stage as chosen by East Coast Independent. The Grind Time Stage sponsored by Bring It Back was an all hip-hop stage that was supposed to appear on all dates of the tour featuring regional and local acts each day. The organizers of the tour and the stage decided to cancel the remaining dates to pursue other ventures after only a few days. The Legends Stage appeared on all California dates of the tour. For the first time, it ventured to the Washington and Oregon concerts. The following bands performed on June 30 at the Las Cruces, New Mexico stop of Warped Tour. The following bands performed on July 18 at the Oceanport, New Jersey stop of the Warped Tour. Bands for this stage were chosen through Starland Ballroom's yearly "War For The Warped Tour" Battle of the Bands competitions. 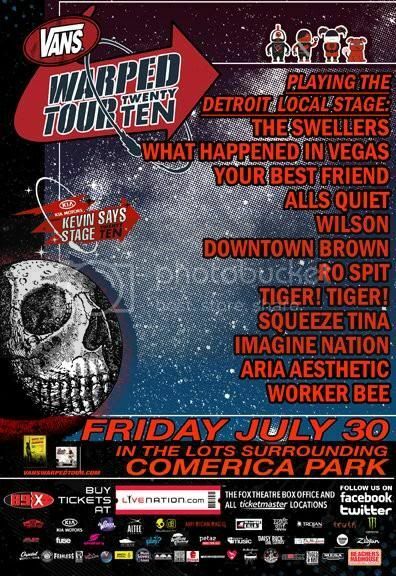 The following bands performed on July 30 at the Detroit, Michigan stop of the Warped Tour. Warped Tour 2010 has 40 tour stops in the United States and three dates in Canada. Christofer Drew of NeverShoutNever hurt his foot badly during the Mansfield, Massachusetts stop of the tour on July 13, 2010. Drew was jumping off of a speaker and landed wrong on his foot. Drew says, "You know, I was jumping around the other day, and I--and we were in Boston or something like that, and I jumped off this high speaker, landed on my foot wrong, and it shattered under the pressure of the fall." Drew continued the tour with the injury. 26-year-old Curtis DeForest of Wichita, Kansas died during the Bonner Springs stop of the tour on August 2, 2010. The cause of death is currently unknown but still under investigation by authorities. Following the Denver stop of the tour on August 8, 2010, Pennywise members Fletcher Dragge and Randy Bradbury were involved in an incident with Alesana on the band's RV. Dragge and Bradbury were both intoxicated and mistakenly entered an empty RV believing it belonged to The Reverend Peyton's Big Damn Band. Alesana returned to find the men and asked them to leave. A scuffle broke out leading to police using a taser on Dragge and arresting him for assault. Alesana dropped all charges. Fletcher followed suit by issuing an apology while taking full blame for the incident and both sides hold no bad feelings towards each other. ↑ Announcing the AP/Advent Stage on Warped Tour!